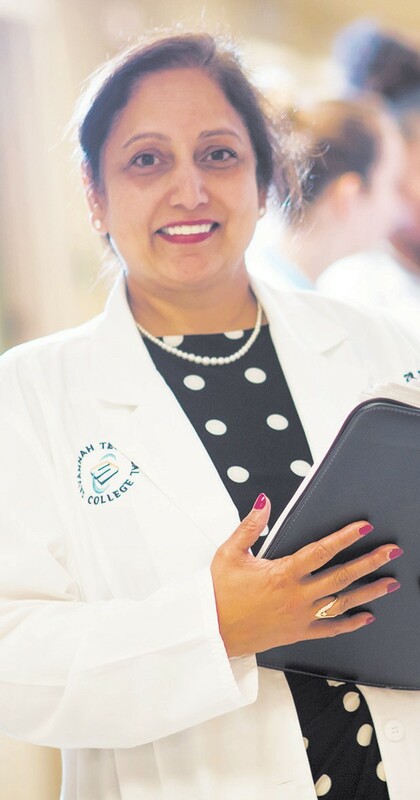 The Georgia Board of Nursing has appointed Asha Anumolu, Savannah Technical College’s Department Head/Instructor of Practical Nursing, to serve on the Nursing Education Committee. Anumolu was appointed for a two-year term. Anumolu is a 1992 graduate of Georgia Southern University with a master’s of science in nursing with a specialization in maternal-infant nursing. She earned a bachelor of science in nursing from Columbia Union College in Silverspring, Maryland. At Jesus and Mary College in New Delhi India, she earned a bachelor’s of arts in economics & statistics with honors in 1982. In 2008, Anumolu was named department head for the Practical Nursing program at Savannah Technical College. Anumolu completes annual accreditation reports for the Georgia Board of Nursing and the National League of Nursing. She revamped STC’s course curriculum to reflect the course competencies and accreditation requirements. She also instituted policies to maintain safe practice standards. She is consortium chair for the region and participates at state and national levels to review core curriculum for practical nursing. Savannah Technical College’s nursing program has had an average 97.15% National Council Licensure Examination (NCLEX) passing rate for the last two years. This competitive admission nursing program prepares graduates to pass the NCLEX-PN to test to be an LPN and work in doctor’s offices, for the health department or for nursing homes. For more information on the LPN and other Health Sciences programs visit: Savannahtech.edu/HealthSciences.